Earn up to 17 EarthHero Points for this purchase! 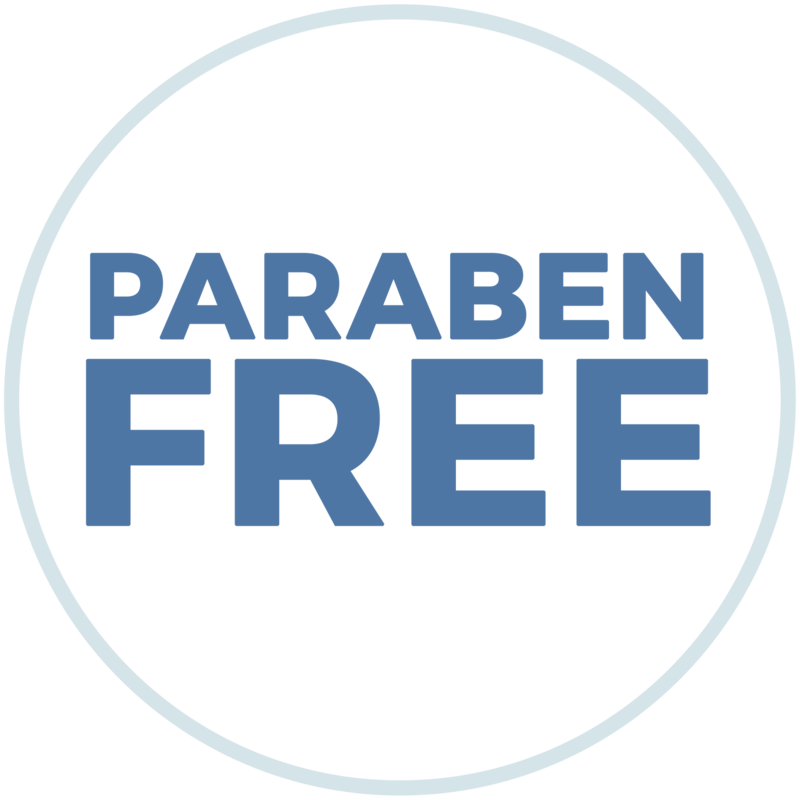 Parabens are synthetic chemical preservatives, commonly used in beauty products like shampoo, lotion, and deodorants. Parabens can accumulate in your body, and have been linked to hormonal disruption and reproductive problems. In studies of breast cancer patients, parabens have been found in the tissue of cancerous tumors–yikes! If you want to avoid Parabens in your beauty products, keep an eye out for methylparaben, propylparaben, butylparaben, and ethylparaben in the ingredients list. Organic materials and ingredients are grown without the use of chemical pesticides or fertilizers, promoting a healthier use of land and decreasing harmful agricultural runoff. By steering clear of toxic chemicals, farm workers experience less exposure to hazardous conditions, promoting social responsibility as well as environmental stewardship. Choosing organic materials eliminates the use of insecticides and other harmful chemicals, promotes efficient resource use, and results in a safer products and a cleaner planet! Plant Based Resins are used as an alternative to fully-synthetic plastics. Instead of using Petroleum as the main base ingredient to form plastic, some companies have started replacing a portion of the ingredients with plant and vegetable extracts. This lowers the amount of resources extracted to create purely synthetic products, and often provides a use for agricultural byproducts such as corn or flax. Some plant based resins are made from 100% plant materials, and can be composted in industrial facilities. 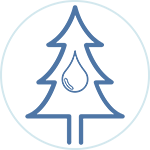 EarthHero recommends checking with your local compost facility to determine which items are safe to compost. Protect your skin while preserving the ecosystems you love with Stream2Sea's high-performance Tinted Mineral Sunscreen (SPF 30). With a potent antioxidant blend of green tea, tulsi, wakame, and olive leaf for nourishment, this non-greasy sunscreen offers both broad spectrum UVA and UVB protection, so you can play on without getting burned. Tested by chemists to be safe for our reef ecosystems, this mineral-based sunscreen is water resistant for up to 80 minutes of swimming or activity, and won'tRead More run into your eyes with sweat. While classic mineral sunscreens can be temporarily whitening, the added natural tint blends well with most skin tones for a flawless finish. To use, apply the biodegradable formula in sections, and rub in well (a little goes a long way!). Send your empty 6oz tube back to EarthHero, and we'll recycle it through TerraCycle! Fact: Over 6,000 TONS of skin care products enter coral reefs from tourist activities alone. And that’s not counting the products that enter our rivers, lakes and streams through runoff, sewage, and more. Stream2Sea knows that what we put into our water matters, which is why they’ve formulated their products without benzophenones, oxybenzones, octinoxate, or parabens, ensuring the highest quality sunscreen for you–without damaging sensitive marine life. Plus, there’s no nanoparticles, fragrances, phthalates, aerosols, or other yucky additives that they’ve found don’t benefit our reefs or bodies. 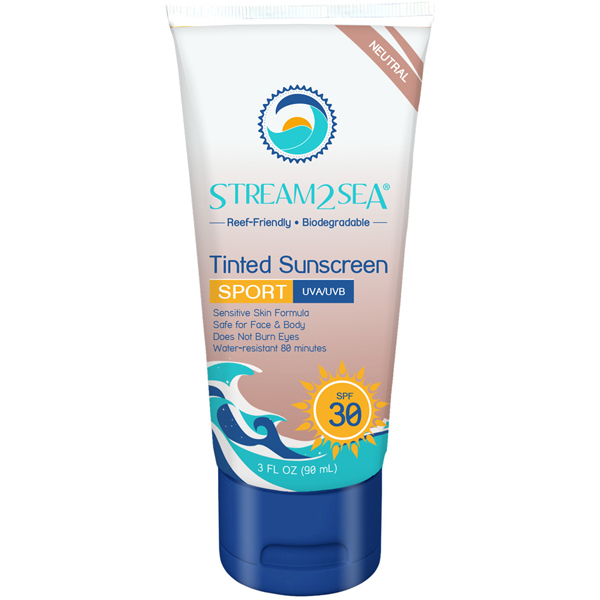 Not only is Stream2Sea great for the reefs, but it’s a sunscreen that truly works to stop sunburns. All of their sunscreens exceed the FDA’s rating for 80-minute water resistance, and don’t run into your eyes (or the ocean) if you sweat or swim. Any sunscreen residue that may come off in the waters is 100% biodegradable in both saltwater and freshwater, as well as non-toxic for fish and coral. As a vegan and mineral based sunscreen, Stream2Sea sunscreens actually reflect the sun’s harmful rays, instead of absorb them, and are gentle enough to be used on babies and children. With their 100% recyclable tubes made from sugarcane resins, they have completely eliminated harmful plastics from their production, and use eco-friendly inks and recycled paper products for any brochures, cartons, or other documents.